Plus I haven’t gone back this far in time lately and I’ve been missing the aesthetic of this era. I mean, even the censor certificate back then was pretty. The movie opens with a ship in full sail and its sailors engaged in singing a lusty sea-chanty. But the presence of a wealthy man named Sir Mangal Das (SK Hasan) and his little girl Leela (Baby Madhuri, so adorable), traveling to Bombay, spells certain disaster as we all know: child + rich parent(s) + ship @ sea = shipwreck + separation(s). I am enchanted by the detail in the ship and its denizens, a little less so by the blatant racism although of course Indians learned it from experts and it was fairly standard in films at the time everywhere. Baby Madhuri is the cutest little “Indian Shirley Temple” ever (and there were a few of them). I believe she is the same Madhuri who was Meena Kumari’s little sister and Mehmood’s first wife, but here she is a just a ringleted little moppet. Before she goes to bed, Leela’s father shows her some papers that (I think) prove that she is the heiress to his large fortune and secures them in a briefcase. Sure enough, soon after that a huge storm blows up. Leela’s father ropes her to a lifesaver along with her doll and the briefcase and pushes her off into the raging sea, watching sadly as she bobs off into the distance. I feel sad too, and am not very sure that Baby Madhuri’s sobs are “acting”. Also I am not clear why, thus secured to a flotation device, she couldn’t just stay with her father and the crew on board, but never mind. As dawn breaks, Leela washes up on a tropical shore populated by a lot of wildlife stock footage: monkeys, elephants, big cats. Clutching the briefcase and her doll, she trudges into the jungle where—in a nice twist—she is adopted not by our cousins the apes but by a family of lions with two cute little cubs, and grows up to be Fearless Nadia. Twenty years have passed and Mangal Das, having survived the shipwreck as well (I knew he should have kept her with him! ), has long been looking for his long-lost little girl. He refuses to give up on her despite the urging of his brother Mohanlal (Dalpat) who thinks she must surely be dead (he also obviously has ulterior motives, being Dalpat and therefore villainous). Mangal Das decides to mount a search expedition in far-off Nigeria, accompanied by Mohanlal. There, Mangal Das hires a pipe-puffing safari hunter named Surendra (John Cawas). He brings along his friend Hamid (Sardar Mansur) who appears to be Ancient Assyrian royalty mixed with North African mercenary. Surendra and Hamid are also accompanied by an extremely irritating CSP guy inaptly called Bahadur (Mitthu Miyan) whose catchphrase for some reason is “lakh rupaiya!”. Hamid warns Mohanlal and Mangal Das about the dangers of jungle travel (or so I gather), and the savage natives of Harambano. Undeterred, Mohanlal sets off the next day (not sure what Mangal Das does, presumably he stays behind in the relative comforts of a hotel) with Surendra, Hamid, Bahadur and a host of blackamoor caricatures in the form of local bearers. Forced to cross a bubbling hot spring they obviously fear, the bearers finally flee when the expedition is attacked by tribals from Harambano. After a short exchange of spears and gunfire accompanied by very dramatic death (hint: bellow “aaaaarrrrggghhhh”, clutch chest, arch forward, fall on face), our intrepid foursome escape with just their rifles and the clothes on their backs while the natives make off with the rest of their supplies. Hamid pursues them, trying to retrieve at least the ammunition, but the Harambanoids (I made that up) tie him to a tree just as several lions arrive on the scene. 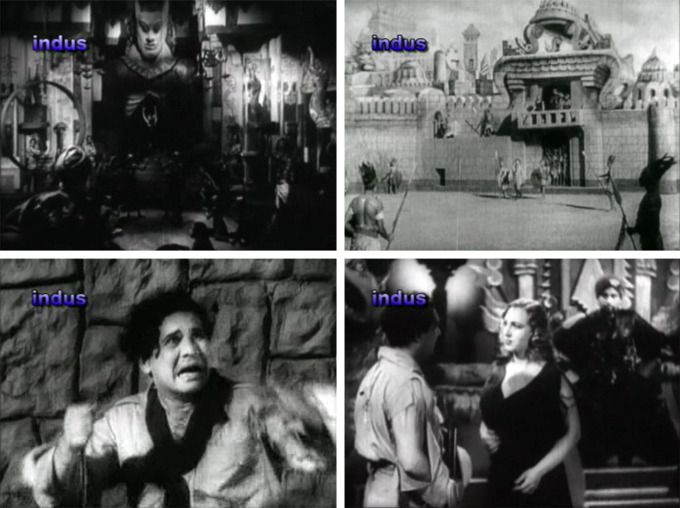 Surendra is attacked by a lioness when he goes to rescue Hamid, and Bahadur (for once useful) shoots her dead. 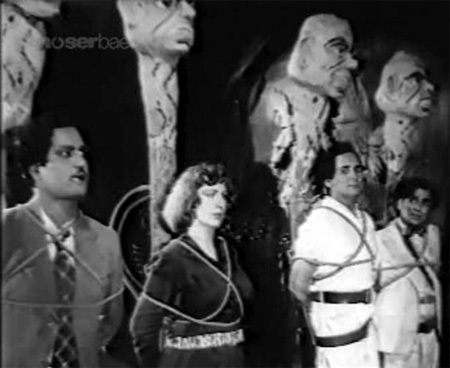 Pursued by her angry relatives, the men flee into a cave and play dead themselves until they are rescued in turn by the arrival of Leela, who informs them that her name is Mala and that she is the daughter of the Raja of Harambano (Hari Shivdasani!). She agrees to take them to see the king. He lives in a palace that resembles a one of those giant dragon floats seen in Chinatowns the world over at New Year’s, and seems to fancy himself some sort of eastern potentate (Fu Manchu moustache, crossed arms tucked into sleeves, events announced by earsplitting gong). He is watching a sultry woman named Meena (Radharani) dance. She might be a concubine, or his wife, I have no idea; but she has a definite if one-sided rivalry going on with Mala. The Raja is not pleased to see strangers in his territory and orders them executed. Mala intervenes, suggesting a contest between Surendra and a large tiger, with the winner going free (unless it’s the tiger, in which case it would probably just go back into its cage). I ponder briefly on the fact that there are no tigers in Nigeria, or indeed on the whole continent of Africa, but…never mind. It also seems strange to me that Mala should be so fond of her lion family, but has no qualms about watching the tiger get knifed to death. Maybe she is certain the tiger will win, but of course it doesn’t. Surendra kills it (I love how scared he looks though when it jumps him) and the king is forced to let the four men go. Meena watches sulkily as Surendra and Mala gaze into each other’s eyes, and the four men take their leave after getting their guns back. The king and Meena now discuss Mala at some length, but I have no idea what they are saying other than that she is not really the Raja’s daughter, which I already knew. So I am grateful when we return to Surendra and company, now menaced by another not-native-to-Africa tiger. This affords Mala the opportunity to swing through some trees a la Tarzan (but without the yell) and Homi Wadia the use of some stock lion-vs-tiger footage as Shankar takes on the tiger at Mala’s command. Reaching the not unreasonable conclusion that these guys aren’t going to get far without her help, Mala invites them to stay the night in her cave. Mohanlal really really wants to go home (especially since he didn’t want to come on this journey to begin with and has no wish to find Leela), but the others accept her offer. Then as Surendra and Mala romance by the light of the silvery moon, Mohanlal spots the telltale doll and briefcase, still sitting there in their niche all these years later. When he opens the briefcase to read through its contents Shankar snarls frighteningly and he is forced to leave it there for the time being. But of course he now knows for sure that the true heiress to his brother’s fortune is still alive, and that she is Mala. He says nothing to Surendra or Hamid, and the next day Mala accompanies them back to the Raja’s palace for their ammunition. I’m not clear why they didn’t think of that before they left the day before…but never mind. The Raja gives them their bullets back and Surendra now asks if Mala is really the woman they are looking for, Leela. He explains that Mangal Das is looking for his long-lost daughter and that Leela is an heiress. But Mala indignantly denies it, saying that the king is her father and she belongs in this jungle (at least in my head that’s what she says). She tells the four men to leave, but without her to protect them they are quickly recaptured by the Harambanoids (possibly at Meena’s behest this time). Manly Surendra can’t put up a fight because a monkey drops a huge coconut on his head and knocks him out, so they are taken back and chained up in the palace dungeon. Meena pays them a visit there, and she and Mohanlal join forces. I’m guessing their plan to be along the lines of Meena pretending to be Leela and splitting the fortune with Mohanlal. As she and Mohanlal travel through the jungle they come across Mala sunbathing on a tree branch and shoot her. Mohanlal retrieves the identity-confirming briefcase and they flee towards the river and passage back to civilization. Poor Mala lies wounded, and Surendra, Hamid and Bahadur are abandoned to an uncertain fate, chained to large Pez Dispensers the likes of which I have seen before! Will Mala survive her wounds? Is Shankar a good medic? Will Mohanlal and Meena make it back to Mangal Das and his money? What will happen to Surendra, Hamid and Bahadur? and oodles more action and suspense! The romance between Surendra and Mala is not really the point but tepid as it is, it doesn’t interrupt or irritate (it’s sort of amusing, actually, with lots of posturing and turning of profiles to the camera). I am sure that part of this movie’s charm for me lies in the nostalgic (for me) colonial African atmosphere that I grew up in; but it’s also a ripping good yarn with something interesting at every turn, many trademark Wadia loony touches, and of course Nadia. How I love Nadia. Here’s hoping that one of these days more of her will find its way into the digital age (with subtitles and no purple logos!) for us to savor. Make it happen, Universe! Posted on February 26, 2012 at 5:54 pm in Hindi film history, Hindi movies	| RSS feed You can skip to the end and leave a reply. “it’s no secret that Fearless Nadia is one of my idols (and I’m not alone in that by any means)”. I was wondering who would have played that role if it were to be remade today. Not a single actress comes to my mind…. Are you sure Ash’s actions are not CGI? Not all of them!!! She is pretty good, seriously. So nice to see and read more Nadia, Memsaab! Thanks! Now, where do I buy this VCD!!! This film started off rather delightfully, but I began yawning somewhere in between – it got too tedious after a while. 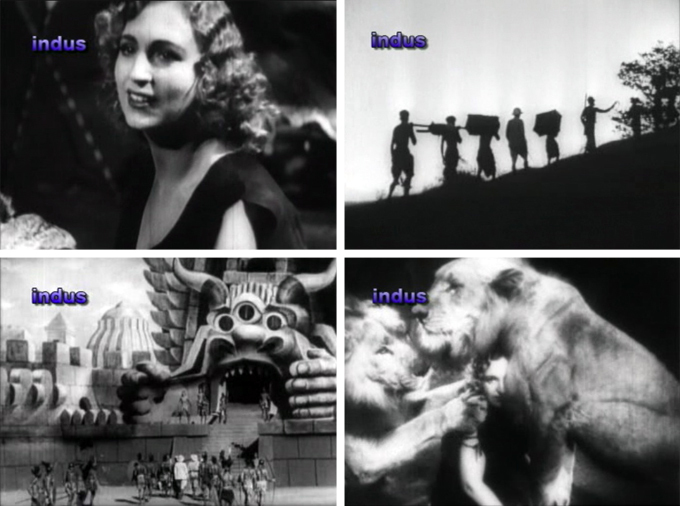 Still John Cawas did look wonderful, and Fearless Nadia was at her swinging-on-the-vines best. And that whiskey song was so much fun! SO many moments in this that had me chuckling – in fact it is one big chucklathon (I made that up to match your “Haramabanoids”. ;-)). That censor certificate is indeed pretty. You are so right about the aesthetics of that period. Looking at the screenshots and reading your review, I feel that they made a great effort in those days to tell a story. After all, that was what film-making was about – telling a story in the form of visuals. So the camerawork, the costumes, everything (yes, including the muscle-men) reflected this effort. And since a lot of it was done manually (or with the help of equpment that would now be considered very primitive), one can only admire the ingenuity of the film-makers of those times. I did not know these films were still available, I was under the impression that they had gone the Alam Ara way, well this is great, these films are a treat to watch I am sure. Well some of them are, but not as many as I would like! And they survive only to be chopped up and defaced with logos and scrolling ads…SIGH. Well I’m glad you think so, but I really loved the film :) It took a while, but yes I finally got it to play. There’s just one section where there seems to be a glitch! 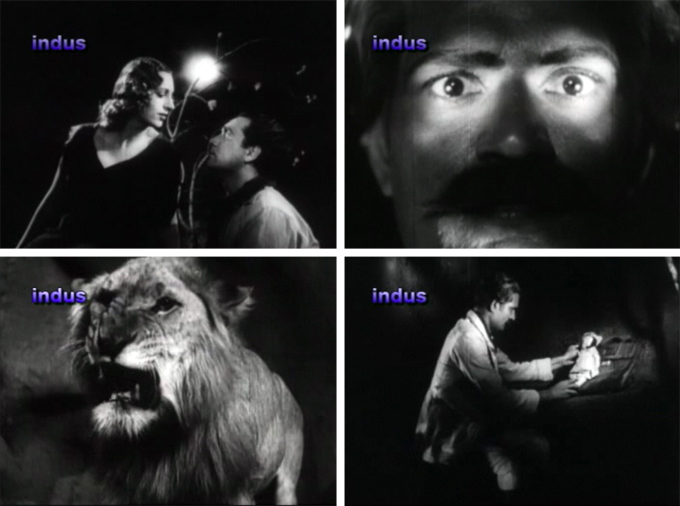 I never know what to make out of Fearless Nadia’s films. They are boring in spite of the very interesting concept of a female swashbuckler/fighter//Tarzan etc etc, and I am one who doesn’t normally get bored while watching old films, and like all genres, concepts, cultural background of the time. That’s okay with me! I don’t find them boring…just many of the songs, as I said :) But I zoom through those and can get back to the crazy. I think I don’t get bored because there’s always just so much to LOOK at. Weird statues, fun outfits…I love them. Thank you for posting this film.I actually had missed this film in my younger days and then I did not try also. John Cavas and Fearless Nadiya-a wonderful combination for the souls enjoying romance,thrills and known and predictable(expected too) mysteries. Two points here from your write up. First,Not madhuri,but Madhu was Meena kumari’s sister and Mehmood’s wife. Second,I was simply thrilled and very happy to read the word Fu Manchu (forget the mustache part).I was an ardent fan of Fu Manchu novels by Sax Rhomer and enjoyed reading the encounters of Denis Nayland Smith and Dr.Petri with the Burmese Thug Fu Manchu and his gang.After many many years I heard the name in some context. Thank you for refreshing my younger days’ memories ! Most people know evrything about Fearless Nadiya(Mary Evans,d/o Australian soldier Herbert Evans and Greek mother Margaret),but not many people know much about John Cavas. That way,not much info is available about him either.He was born in 1910 at Jabalpore(Madhya Pradesh,India)-which means he was 2 years younger than Nadiya.He was a body builder and joined Wadia Movietone.Hunterwali was his first film,while it was Nadiya’s third film.Their jodi soon became very popular and they acted together in almost 15 films or so.Their last film together was Circus Queen-1958. John Cavas also directed some films like Mala the mighty-42 and Baghdad ka Jaadu-56. After quitting films he became the Manager of Wadia Movietone and was given the third floor flat in the office building of WM itself,where he breathed his last on 4-10-1993.He was unmarried. Thanks once again for the pleasures you gave by posting this film. @Memsaab – Enjoyable review as always. What I especially liked is that the censor certificate is actually readable. That must be a rarity in films nowadays. This film seems quite interesting with its attention to detail, even though the story is on expected lines. Arunjumar ji – Thanks for the additional information. You are right in saying that people have less knowledge of John Cawas compared to Fearless Nadia. I have to watch a fearless Nadia movie one of these days. You make them sound so good! Ah but not everybody enjoys them (see above)! I do though. Ah, finally, a Fearless Nadia film on DVD. Are there any more? I must go look for this. But isn’t the Indus logo vile? I wonder what they are thinking when they do this? It’s a VCD and apparently out of stock/print. I know what you mean about the vile logo. I don’t believe they ARE thinking when they do that, any of them. That is awesome :) One cannot have too many shiny satin sailor suits! Come and visit me Laura and we’ll watch Nadia together! It was very nice to see a good writeup of this film. I haven’t seen the film, but I did see the whiskey song a while back, and I thought of posting it on my blog, too. And by the way, thanks to Laura Boyes for pointing out the similarity to Ginger Rogers’ outfit in Follow the Fleet. I love Ginger Rogers – especially in her films from the ’30s and ’40s. This song is from the film BAZAAR-1949.it was a Madhukar pictures’ film,directed by K.Amarnath.The Music Director was Shyamsunder,the Lyricist was Qamar Jalalabadi and the singer was Shamshad Begum. The wordings are-“Piya aaye aa kar chale bhi diye “. It was filmed on Cuckoo-as rightly identified by you. I haven’t really found out or figured out what film it’s from. :) Just another Cuckoo clip that I found floating around by itself without any adequate information that nonetheless became totally embedded in my memory. See The Encyclopedia Arunji Deshmukh’s comment above :)))) I think I might even have Bazaar, will have to look around. I am sure seeing these in a theater on the big screen would be a memorable experience for a kid! I’m glad you enjoy the blog and thank you for your kind words. What Gaby ji has said about the film is correct.I have seen the film. In case you decide to see the film and if there are no sub-titles,for your benefit,I give below a synopsis of the film,for your convinience. KHILADI-1968 was a Basant pictures’ film,produced and directed by Homi Wadia.In this film,his Asst. 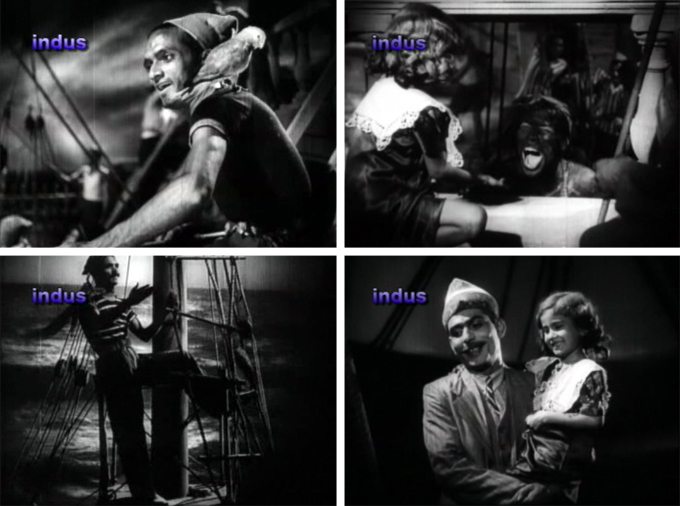 was John Cawas,who was Nadiya’s Hero in several films earlier.The music was by Lala-Sattar. 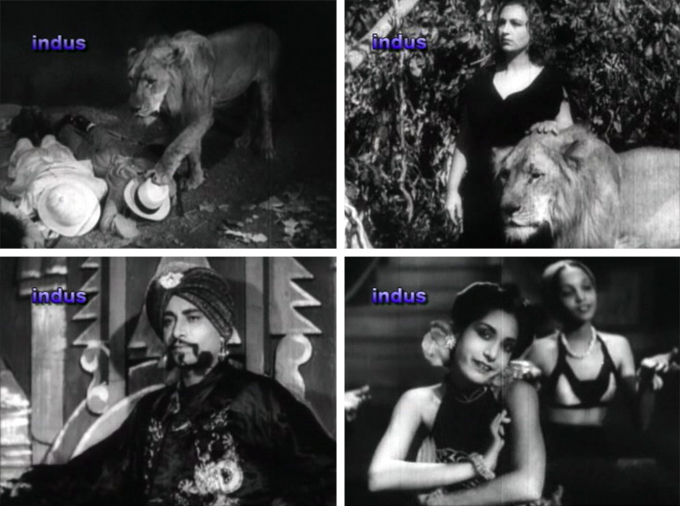 The cast was Nadiya,Dilip Raj,Uma,Sujata,Amarnath,Shaikh,W.M.Khan (he is the same actor who had acted in India’s FIRST talkie ALAM AARA-1931,and who is credited with singing the first ever song in a film’-de de khuda ke naam par’),etc etc. Dilip Raj is deputed to trace and smash a criminal gang which has abducted India’s famous scientist professor-WMKhan.He has developed a formula for a drug which can destroy the entire nation. The Hero meets X-1 (Nadiya),a daring patriotic lady,with 6 assistants having diff. skills,for help. X-1 is an expert in disguise and several other arts.She promises to help the Hero and the Heroine(Uma). The criminal gang GOLDEN DRAGON is organised and run by a girl-Sujata,who wants to kill Uma and destroy India. Dilip Raj,X-1 and Uma,together not only rescue the professor but also destroy the gang and thus save India. The film is fast paced and many thrills are provided in succession.One must,however,remember that Nadiya was 60 year old in 1968 and view the film in that light only. Despite the James Bond style ,stunts and fights,the film did not succeed. Fantastic screenshots. And I must say that this one movie that I will be able to sit though. Nadia seated with two lions on her side. I am sure even my two dogs and a cat will enjoy watching this movie. Is this movie available anywhere ? I don’t know if it still is, this is an Indus (if you missed that ha ha) vcd but it may be out of print now. The three-eyed temple with the hands to the side of the mouth is taken from the Italian silent film “Cabiria” (1914). Not copied, but actually cut from that film! It is available on youtube now!!! Do you have a picture for the censor certificate for the film Alam Ara ?